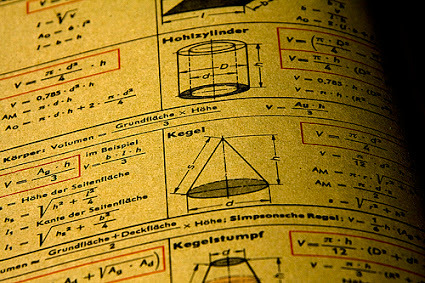 The name “mathematics” comes from the Greek word “mathema”, which means “to study, to learn, knowledge”. In the UK the term mathematics is abbreviated, quite naturally, as maths, however, in the US educationalists use the term “math” instead of plural maths. The reason is of linguistic nature: when used in a sentence, the name “mathematics” acts like a singular noun, therefore, as US educationalists concluded, the abbreviation would sound more natural if it was a singular noun – math, instead of the plural and confusing “maths”. Although its name comes from Greek, math roots go deeper than Ancient Greece. Archeological discoveries, such as cuts on animal bones, show that humans used simple math as early as 30,000 BC. This discovery is not so surprising, if we consider the fact that even toddlers and animals have some natural predispositions towards doing simple math operations. For example, when looking at two sets of dots many animals can recognize which set is bigger and which one is smaller. Next time your students start to complain that math is too difficult for them, use this example to prove that math skills are developed from basic predispositions, which are inherent. Nowadays, we can’t imagine doing mathematics without zero, but it took some time, before zero got its way to math and the decimal system. For example, Roman numerals did not include any symbol for zero (although Romans used the word “nulla”, which means “nothing”). The origins of the concept of zero are often attributed to the Arabs, because the name zero comes from the Arabic word for “empty”. However, the history of zero should be traced back to 458 AD and farther to the east, as it is now believed that the concept of zero was born in India, with the word “sunya”, meaning empty, used in Jain texts. The symbol of zero, a small circle, is also featured on stone inscriptions found in India and dated 876 AD. Today we can’t imagine math programs and classes without symbols, such as plus, minus, division, multiply and equals, but these symbols are fairly new inventions. The oldest one, the symbol for plus, can be found in manuscripts from the 14th century, however, the youngest symbol, the horizontal line with one dot above and one below, which represents division, was first used in this function in 1659. How mathematicians did their equations before those symbols were invented? They used words and descriptions, which made solving math problems a lot more time consuming. Therefore, let’s be grateful for math symbols! Without them solving math problems would require a lot of writing.